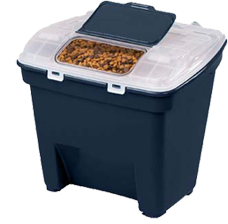 Pet owners love to use plastic bins to store kibble. It’s quick, keeps food fresh and stores easily out of the way. However there are some things to consider before you dump your pets food into this potential health risk haven. Residual oils and fats that transfer to the bin can become rancid after time and contaminate new fresh food. Chemicals from the plastic can seep into the food and cause long term heath issues. Also, keep in mind that plastic may get micro cuts not visible to the eye. These areas can also harbor all kinds of nasty little buggers that can spoil your pet’s food. In some cases mold spores can grow or mites and bacteria contamination may occur which can lead to diarrhea and vomiting. We recommend you open the bag and place (the bag containing the kibble) it inside of the bin. This way you reduce the risk of transferring anything onto the plastic. If you wash out the bin, use hot water, light soap (with limited chemicals) and rinse well. When you are shopping for a bin make sure it is BPA and Phthalate Free, chew proof and has a secure lid to keep bugs and pest out.